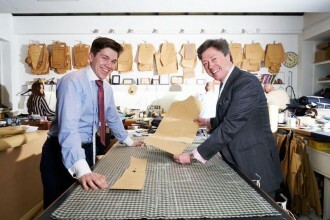 The Savile Row Bespoke Association’s apprenticeship scheme is the lifeblood of Savile Row. It is a prerequisite of membership that each of the tailoring houses of the SRBA take on at least one salaried apprentice. All work is overseen by the Technical Committee of the SRBA, which comprises the Head Cutter of each member house. The completion of an apprenticeship results in the award of the Savile Row Bespoke Association Apprenticeship Certificate, the most valuable qualification in bespoke tailoring. The SRBA apprenticeship awards are held annually in June and assessment is carried out by a maximum of 5 master tailors from different companies within the Savile Row Bespoke Association. The SRBA’s apprenticeship scheme offers a unique opportunity to learn directly at the hands of the most skilled practitioners of bespoke tailoring in the world. Applications for SRBA apprenticeships should be made directly to the member tailoring houses.